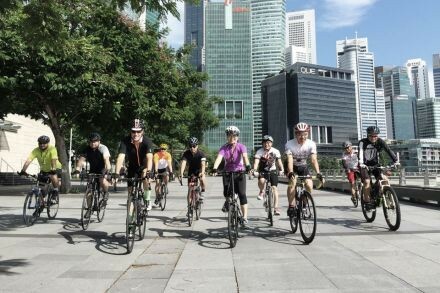 EMPLOYERS in Singapore are riding on the annual OCBC Cycle - this year's event takes place on the Oct 1-2 weekend - to not only promote a healthy lifestyle but to do their part for charity too. A total of 12 organisations have already signed up for The Business Times Cycle of Hope Corporate Bike Ride - a corporate charity ride that is part of OCBC Cycle's charity partnership programme - and raised more than S$20,000 for four charities in the process. Those participating in Cycle of Hope - either the 23km or 42km category - will see more than half of their registration fees donated equally to the charities: Dyslexia Association of Singapore, National University Health System Fund, SportCares Foundation, and The Business Times Budding Artists Fund. Companies can also pick which of the charities they would prefer to support, or even donate more over and above the registration fees, which range from S$980 to S$2,880 depending on the size of the teams. The donations are tax-deductible. Architectural firm Aedas is fielding a team of 15 cyclists at Cycle of Hope. Executive principal Alen Nikolovski tells The Business Times that the company has always made an effort to show care to the city and community by organising and participating in meaningful programmes. Having the staff take part in a sports activity is useful as it promotes team spirit to "work towards a common objective to overcome all challenges and complete the tasks", says Mr Nikolovski. "The team is united by building trust, improving communication and fixing weaknesses. Cycle of Hope is a good team-building activity to increase communication among teammates and create some great memories to share," he says. Yinson Production, meanwhile, is sending a total of 41 participants, including its CEO. According to a spokesman, the company even provides rental bikes at the event for those who do not have their own bicycles, to allow as many people to take part in OCBC Cycle as possible. "We have also organised a post-event breakfast along Boat Quay for all employees and their family members to celebrate our participation. We are confident that this entire experience will serve to build and strengthen bonds and foster close interaction among our staff and their family members," the spokesman adds. Edrington Singapore, a company that makes Scottish whiskies such as The Macallan and Highland Park, will be represented by ten employees, including Martin Reimann, the managing director of Asia-Pacific and India. Many of the employees are avid cyclists, and last year a group of them pedalled 400km all the way from Kuala Lumpur to Singapore to raise funds for Child at Street 11, a charitable organisation that runs a childcare centre for disadvantaged families in Singapore. "Being a responsible corporate citizen is very important to us, and we believe it makes us stronger and more successful as a business. Edrington encourages employees to give their time to volunteer in their communities and raise funds for good causes," says a spokesman. Returning for a second straight year at Cycle of Hope is Singapore Management University (SMU), with the varsity sending a team of 15 cyclists led by its president, Arnoud De Meyer. Kenneth Tan, the director of the Office of Student Life who is part of the SMU team, says: "The Cycle of Hope ride is a wonderful opportunity for staff from different offices in SMU to come together for a common good, participate in a healthy lifestyle activity, bond through shared interests and do something that they all love - cycling." He shares that cycling has become more popular among students and staff at the university, many of whom cycle to and from the campus on Bras Basah Road. "We also have an active student club that organises events ranging from short rides to longer round-island cycling events annually. SMU has also been able to capitalise on the car-free Sundays for staff and students to cycle together," says Mr Tan. OCBC Bank's head of group corporate communications Koh Ching Ching says the local bank is heartened by the response shown by corporates in Singapore so far. She says: "When we first started our involvement with cycling, the intention was to use this sport to bring people closer and to get the cycling community to give back to the less privileged. In our second edition of OCBC Cycle, and in our eighth year as a key sponsor for cycling in Singapore, our mandate remains the same, which is to encourage cyclists to do good, while enjoying themselves at OCBC Cycle." The deadline to reserve a slot to take part in Cycle of Hope is Aug 31. More details are available at ocbccycle.com.